The 2012 Summer Paralympics, the 14th Summer Paralympic Games, and also more generally known as the London 2012 Paralympic Games, were a major international multi-sport event for athletes with disabilities governed by the International Paralympic Committee (IPC), that took place in London, United Kingdom from 29 August to 9 September 2012. These Paralympics were one of the largest multi-sport events ever held in the United Kingdom after the 2012 Summer Olympics, and until the date the largest Paralympics ever: 4,302 athletes from 164 National Paralympic Committees participated, with fourteen countries appearing in the Paralympics for the first time ever. The lead-up to these games prominently emphasized the return of the Paralympic movement to its spiritual birthplace: in 1948, the British village of Stoke Mandeville first hosted the Stoke Mandeville Games, an athletics event for disabled British veterans of the Second World War held to coincide with the opening of the Summer Olympics in London. They were the first-ever organized sporting event for disabled athletes and served as a precursor to the modern Paralympic Games. Stoke Mandeville also co-hosted the 1984 Summer Paralympics with Long Island, New York, after its original host, the University of Illinois at Urbana–Champaign, pulled out due to financial issues. Organizers expected the Games to be the first Paralympics to achieve mass-market appeal, fuelled by continued enthusiasm from the British public following the country's successful performance at the Summer Olympics, awareness of the United Kingdom's role in the history of the Paralympics, public attention surrounding South African sprinter Oscar Pistorius (who had recently become the first double amputee to compete in the Summer Olympics alongside able-bodied athletes), a major marketing campaign instituted by the Games' local broadcaster, and growing media coverage of Paralympic sport. The games ultimately met these expectations, breaking records for ticket sales, heightening the profile of the Paralympics in relation to the Olympics, and prompting IPC president Philip Craven to declare them the "greatest Paralympic Games ever." A total of 503 events in 20 sports were held during these games; for the first time since their suspension after the 2000 Paralympics, events for the intellectually disabled were also held in selected sports. For the third Summer Paralympics in a row, China won the most medals overall, with a total of 231 (95 of them being gold), followed by Russia and Great Britain. As part of a formal agreement between the International Paralympic Committee and the International Olympic Committee established in 2001, the winner of the bid for the 2012 Summer Olympics was also to host the 2012 Summer Paralympics. At the 117th IOC Session in Singapore, the rights to host the 2012 Summer Olympics and Paralympics were awarded to London. As with the Olympics, the 2012 Summer Paralympics were overseen by LOCOG and the Olympic Delivery Authority (ODA). LOCOG was responsible for overseeing the staging of the games, while the ODA dealt with infrastructure and venues. The Government Olympic Executive (GOE) within the Department for Culture, Media and Sport (DCMS) was the lead Government body for co-ordinating the London 2012 Olympics and Paralympics. The GOE reported through the DCMS Permanent Secretary to the Minister for Sports and the Olympics Hugh Robertson. It focused on oversight of the Games, cross-programme management and the London 2012 Olympic Legacy. The Brands Hatch circuit hosted road cycling during the Paralympics. The 2012 Summer Paralympics used many of the same venues as the 2012 Summer Olympics, along with two new locations such as Eton Manor for wheelchair tennis and Brands Hatch for road cycling. London's purpose-built Olympic venues and facilities, including the Olympic Village itself, were designed to be accessible as possible so they could easily accommodate the Paralympics. Some venues also contained additional accessible seating areas during the Paralympics. Transport for London operated the Paralympic Route Network (a downsized version of the Olympic Route Network operated during the Summer Olympics) to facilitate road traffic between venues and facilities. The network provided 8.7 miles (14.0 kilometres) of lanes specifically reserved for Paralympic athletes and officials. TfL continued to operate its Get Ahead of the Games website during the Paralympics, which provided updates and advice for commuters during the Games. Prior to the Games, concerns were raised by TfL commissioner Peter Hendy that London's transportation system might not be able to handle the Paralympics adequately. He feared that the end of the school summer holiday (which fell during the Games) would result in increased traffic, and that commuters might not heed traffic warnings or change their travel behaviour as they had during the Olympics. Sevenoaks railway station was designated as the preferred station for spectators travelling to watch the cycling at Brands Hatch. Organisers chose Sevenoaks over the closer Swanley railway station because of its "existing step-free access and excellent transport links", and because Swanley did not yet have a wheelchair lift. Whilst organisers did not believe that Swanley would be able to have wheelchair lifts installed by the start of the Paralympics, the station finished their installation by early August 2012. The formal handover occurred during the closing ceremony of the 2008 Summer Paralympics in Beijing, when Mayor of London Boris Johnson received the Paralympic Flag from Mayor of Beijing Guo Jinlong. This was followed by a cultural presentation by Britain, which was similar to its presentation during the Olympics' closing ceremony. It featured urban dance group ZooNation, the Royal Ballet, and Candoco, a physically integrated dance group, all dressed as London commuters and waiting for a bus by a zebra crossing. A double-decker bus drove around the stadium, guided by Ade Adepitan, to music composed by Philip Sheppard. The top of the bus was open and folded down to show a privet hedge featuring London landmarks such as Tower Bridge, The Gherkin and the London Eye. Cherisse Osei, drummer for Mika, and Sam Hegedus then performed, before the top of the bus folded up into its original form, sporting multi-coloured Paralympic livery. Both the Paralympic and Olympic flags were formally raised outside of London's City Hall on 26 September 2008. British Paralympians Helene Raynsford and Chris Holmes raised the Paralympic flag. On 8 September 2011 Trafalgar Square staged International Paralympic Day, hosted by Rick Edwards, Ade Adepitan and Iwan Thomas, to coincide with a visit to London by representatives of the IPC. The event celebrated the Paralympic Games, showcasing and demonstrating the 20 sports that would feature during the Games (with some sessions also made inclusive to people with hearing disabilities). It also featured appearances by Paralympic athletes Oscar Pistorius, Ellie Simmonds and Sascha Kindred, and the unveiling of a bronze statue of Pistorius by Ben Dearnley. British Prime Minister David Cameron and London's mayor Boris Johnson also appeared. Two days later on 10 September, supermarket chain Sainsbury's and Channel 4 presented Sainsbury's Super Saturday, a family event at Clapham Common. The event featured showcases of Paralympic sports, and a concert featuring pop music acts including Nicola Roberts, Olly Murs, The Wanted, Will Young, Pixie Lott, Dappy, Sugababes, The Saturdays, Chipmunk and Taio Cruz. Channel 4, the host broadcaster of the 2012 Summer Paralympics in the United Kingdom, promoted its coverage of the Games with a multi-platform advertising campaign that included television adverts, online content, and billboard advertising, some of which carrying the tagline "Thanks for the warm-up." Overall, Channel 4's campaign aimed to change the public's view of the Paralympics, encouraging viewers to see the Games as an "event in its own right" rather than as an afterthought to the Olympics. As part of the campaign, Channel 4 produced a two-minute-long trailer for its coverage entitled Meet the Superhumans, which was directed by Tom Tagholm with input from Deborah Poulton, 2012 Paralympic Project Leader and Alison Walsh, Editorial Manager of Disability, both at Channel 4. The trailer, set to Public Enemy's song "Harder Than You Think", focused on the competitive and "superhuman" aspects of Paralympic sport, while acknowledging the personal events and struggles that reflected every athlete's participation in the Games. Meet the Superhumans premiered on 17 July 2012, airing simultaneously on 78 different commercial television channels in the UK (which included rival channels ITV and Sky1). The advert was met with critical acclaim: Adweek's Tim Nudd declared it "the summer's most stunning sports commercial", while Simon Usborne of The Independent felt it was "an act of branding genius" and "a clear bid to bring the Paralympics from the sporting wings to centre stage." The advert was seen by an estimated audience of 10 million viewers; Channel 4's marketing and communications chief Dan Brooke estimated that reaction to the advert through social media was double that of the première of the BBC's trailer for its Olympics coverage. Meet the Superhumans won a Golden Lion award at the Cannes Lions Festival in June 2013, losing the overall award to the railway safety PSA Dumb Ways to Die. Sir John Hegarty, the jury president said of it: "When you've got some really outstanding work it is tragic in some ways it can't get a bigger award, but there can only be one grand prix", while jury member Carlo Cavallone added "[Meet the Superhumans] is an amazing campaign, one of the golds that went through [the judging process] immediately ... Everyone felt it had the highest level of craft. It puts an issue that was really important before London 2012 to raise awareness of the Paralympics [and] they were hyper successful … Dumb Ways to Die was a tough contender." A post box outside the National Spinal Injuries Centre in Stoke Mandeville was painted gold in honour of the village's role in the history of the Paralympic movement. In August 2009, Royal Mail unveiled a series of 30 stamps (reflecting the 30th Olympiad) in honour of the 2012 Olympic and Paralympic Games, released in batches of ten between 2009 and July 2011. Each stamp featured an Olympic or Paralympic sport and the London 2012 logo. As it had done during the Olympics, Royal Mail honoured Britain's Paralympic gold medallists by painting a post box gold in each of their home towns (along with an additional post box outside the National Spinal Injuries Centre in Stoke Mandeville, in honour of its role in the Games' history), and featured them on commemorative stamps released throughout the Games. Royal Mail originally planned only to release a series of six stamps with group portraits of Britain's medallists; however, the decision was met with backlash from critics, who argued that the organization was discriminating against Paralympians by not granting them the same individual recognition as their Olympian counterparts. Olympic shadow minister Tessa Jowell was also critical of Royal Mail's plan, saying that the stamps were a symbolic aspect of Britain's celebration of the Olympics and that "it would be a shame if this important symbol was not offered to our Paralympian heroes as well." Royal Mail initially defended its decision, arguing that it would have been "logistically and practically impossible" to issue individual stamps for each gold medallist, since it expected the British team to meet or exceed its performance at Beijing of 42 gold medals. As a result of the criticism, Royal Mail announced on 15 August 2012 that it would release individual stamps for each British gold medallist during the Paralympics. Several Paralympics-specific events were held during the London Prepares series of test events for the Olympic and Paralympic Games; these included the London International Goalball Tournament, and the London Disability Grand Prix—which was also the first Paralympic event to be held at London's Olympic Stadium. A group of torchbearers in wheelchairs bringing the Paralympic flame through Canary Wharf. The Paralympic torch relay began on 22 August, when groups of integrated scouts kindled four Paralympic flames on the highest peaks of each nation of the United Kingdom; Scafell Pike in England, Ben Nevis in Scotland, Slieve Donard in Northern Ireland, and Snowdon in Wales. On 24 August the four flames were used to light ceremonial cauldrons in London, Edinburgh, Belfast and Cardiff during special "Flame Festival" events; smaller "Flame Celebration" events were also held in various communities over the bank holiday weekend. On 28 August the four flames were united during a ceremony at Stoke Mandeville Stadium. The flame then travelled a 92-mile (148-kilometre) route to Olympic Stadium in a 24-hour relay, with 580 torchbearers working in teams of five. After a two-hour weather delay, a backup flame was taken straight to the stadium as a contingency, and the relay route was modified. However, as the opening ceremony's parade of nations took longer than expected, the flame was able to arrive at Olympic Stadium in time. 2.7 million tickets were offered in total, including event-specific tickets and those granting access solely to the Olympic Park, along with multi-event passes offered for ExCeL London and Olympic Park that were intended to allow spectators to discover a variety of Paralympic events. Unlike previous Paralympics, tickets were in extremely high demand, and the ticket allocation was increased from the originally planned 2.5 million. Whilst the period during the Olympics has historically been the busiest for Paralympic sales, 1.4 million tickets were already sold before the start of the Summer Olympics, already surpassing the total number sold in Sydney. The high demand resulted in technical issues with the Ticketmaster-operated website, which led to complaints via social networking services by users who were struggling to order. Organisers expected the first ever sell-out in the history of the Paralympics. LOCOG's chief executive Paul Deighton remarked that "the interest in attending the Paralympics has been extraordinary from the start." This success was attributed to the enthusiasm surrounding Great Britain's performance during the Olympics, fan interest in South African sprinter Oscar Pistorius—who had become the first ever double amputee to compete in the Olympics alongside able-bodied athletes, and affordable prices. On 8 August LOCOG announced that 2.1 million tickets had been sold (600,000 in the previous month alone), breaking the record of 1.8 million set in Beijing (1.6 million tickets were also distributed by the Chinese government). IPC president Philip Craven congratulated London for this achievement, crediting it to "the insatiable appetite the public has for top class elite sport", and noted it would be fitting for a Paralympics held in its spiritual birthplace to have filled venues. By the opening ceremony, 2.4 million had been sold, with the remaining 100,000 sold during the Games; 10,000 were offered each day. The last 800 tickets to the Opening Ceremony were distributed to police and the military, while Mayor Boris Johnson arranged for the distribution of 1,100 to members of London's youth athletics clubs. Due to popular demand, a further 100,000 contingency tickets were released on 6 September (which included multi-event passes, and event tickets given up by sponsors and partners), along with 100,000 giving access solely to the Olympic Park. The 2012 Summer Paralympics used an emblem sharing a common design with that of the Summer Olympics—the first time this had ever been done. The logo, designed by Wolff Olins, was unveiled on 4 June 2007, and is a representation of the number 2012. The Paralympic version has its own distinct colour scheme, and substitutes the Olympic Rings with the Paralympic "agitos". The official mascot of the 2012 Summer Paralympic Games, Mandeville, was unveiled alongside its Olympic counterpart Wenlock on 19 May 2010. As characters, they are portrayed drops of steel from a steelworks in Bolton, and feature singular camera eyes—representing "focus" and the cameras being used to capture the Games. Mandeville is named in honour of Stoke Mandeville due to its significance in the origins of the Paralympics. Mandeville also wears a helmet emblazoned in the red, green, and blue colours of the Paralympic emblem. The opening ceremony was held on 29 August at the Olympic Stadium. It was inspired by William Shakespeare's play "The Tempest" and themed around the concept of "Enlightenment". It featured appearances by theoretical physicist Stephen Hawking, along with actors Ian McKellen and Nicola Miles-Wildin playing the roles of Prospero and Miranda from "The Tempest". The ceremony also featured a performance by British electronic music group Orbital. The leading UK disabled theatre company Graeae played their version of the polio survivor Ian Dury's 1981 protest song 'Spasticus Autisticus'. The final bearers of the Paralympic flame represented several generations of Paralympic athletes. "Future" Paralympic athlete Joe Townsend, a Royal Marine who lost both of his legs after stepping on a land mine on duty in Afghanistan, delivered the flame to Olympic Stadium via a zipline from the ArcelorMittal Orbit tower. He passed the flame to long-time British Five-a-side football captain David Clarke, who then passed it to the lighter of the Paralympic cauldron, Margaret Maughan, who was the winner of Britain's first gold medal at the first official Paralympics, in Rome. The closing ceremony was held on 9 September at the Olympic Stadium. Entitled "The Festival of the Flame", the ceremony was themed around the gathering of people in celebration, and was directed by Kim Gavin, who also directed the closing ceremony of the Summer Olympics just a few weeks prior. The ceremony featured sequences set to a live performance by the British rock band Coldplay, who were accompanied by guest performers such as the British Paraorchestra (who accompanied the band on "Strawberry Swing", and also performed the Paralympic anthem), Barbadian singer Rihanna (who performed her collaboration with Coldplay, "Princess of China", and her solo hit "We Found Love") and American rapper Jay-Z (who performed "Run This Town" with Rihanna and Coldplay, and joined in a reprise of "Paradise"). To mark its hosting of the 2016 Summer Paralympics, the Paralympic flag was passed from Boris Johnson, Mayor of London to Eduardo Paes, Mayor of Rio de Janeiro. LOCOG chief Sebastian Coe and IPC president Philip Craven both congratulated London for its successful hosting of the Paralympics; Coe was proud that both the Olympics and Paralympics in London could be labelled "Made in Britain", while Sir Phillip felt that the Games were the "greatest Paralympic Games ever." Ellie Simmonds and Jonnie Peacock shared the honour of extinguishing the Paralympic cauldron, sharing its last flame on torches to others throughout the stadium to represent its eternal spirit. London 2012 had the largest number of athletes and participating nations of any Paralympic Games. A total of 4,302 athletes from 164 countries competed in the Games. This represented an increase of 291 athletes and 18 countries from the 2008 Games, which had 4,011 athletes from 146 countries. Fourteen countries made their Paralympic début: Antigua and Barbuda, Brunei, Cameroon, Comoros, the Democratic Republic of the Congo, Djibouti, the Gambia, Guinea-Bissau, Liberia, Mozambique, North Korea, San Marino, the Solomon Islands and the US Virgin Islands. Trinidad and Tobago returned to the Games for the first time since 1988. Andorra made its début in the Summer Paralympics, having already made three appearances at the Winter Paralympics. Malawi, which would have been making its debut at the Games, and Botswana, were both due to send delegations but withdrew hours before the opening ceremony citing a lack of government funds. The programme of the 2012 Summer Paralympics featured events in 20 sports. The number of events in each sport is noted in parentheses. Events for athletes with intellectual disabilities (ID class) returned to the Paralympics in athletics, swimming, and table tennis for the first time since 2000. ID events had been suspended following the 2000 Summer Paralympics, after the Spanish basketball team was stripped of their gold medals when it was found that only 2 of their 12 team members actually suffered from intellectual disability. The IPC would impose higher scrutiny on intellectually disabled athletes in London, and also implemented a new procedure involving "sports intelligence" testing to better determine eligibility. Also beginning in 2012, sighted guides became eligible to receive medals in certain events; sighted goalkeepers in 5-a-side football, along with guides and pilots in athletics and cycling and boccia assistants were now able to receive medals for their contributions. Previously in the case of tandem cycling, where a visually-impaired rider takes the rear of the bike with a sighted pilot in front, only the visually-impaired rider actually received a medal. The official schedule was published on 25 August 2011. This table is based on the medal count of the International Paralympic Committee (IPC). The ranking is sorted primarily by the number of gold medals earned by a National Paralympic Committee (NPC). The number of silver medals is taken into consideration next and then the number of bronze medals. If countries are still tied, equal ranking is given and they are listed alphabetically by IPC Country Code. A public viewing event on the BT London Live stage at Trafalgar Square. Broadcast rights to the 2012 Summer Paralympics were sold to local broadcasters by LOCOG, with production of the world feeds sub-contracted to Olympic Broadcasting Services (OBS). The Games saw a significant growth in media coverage for the Paralympics; LOCOG reached deals with over 36 broadcasters to televise the Games in over 100 countries. LOCOG chief Sebastian Coe stated that "beyond how the commercial value of this package has raised the bar financially for the Paralympic movement, the fantastic broadcast coverage we have agreed will help us take advantage of this opportunity to inspire disabled people of all ages to take up sport and be a catalyst for continued change in public attitudes towards disability." LOCOG reached deals with broadcasters such as China Central Television, the Korean Broadcasting System, NHK, Rede Globo and SporTV in Brazil, the TV Pool (a consortium of free-to-air broadcasters in Thailand consisting of Channel 3, Channel 5, BBTV Channel 7, and Modernine TV), and the Australian Broadcasting Corporation to air coverage. The games were to be broadcast on television in the United Kingdom by Channel 4, replacing long-time Paralympic broadcaster BBC in a £9 million deal; the BBC still held radio rights, with coverage on BBC Radio 5 Live and 5 Live Sports Extra. The IPC webcast approximately 780 hours of its coverage through its YouTube channel, with four streams of coverage in English and one in Spanish. Channel 4's coverage of the Games was billed as the most extensive Paralympic coverage ever broadcast in the United Kingdom; it promised over 150 hours of live coverage throughout the Games on Channel 4 and sister channel More4, and additional coverage online and through special channels carried by Freesat, Sky and Virgin TV (in both standard and high definition). The broadcaster also invested around £600,000 towards training new on-air personalities with expertise in disability sports for the Games, many of whom were disabled themselves—they would also be joined by Channel 4 News anchor Jon Snow, and BBC Sport personality Clare Balding. Channel 4 also broadcast supplemental programming to lead towards the Games, such as Paralympic-focused documentaries, other IPC championships, and That Paralympic Show, a weekly program focusing on disability sports. During the Games, comedian Adam Hills (who himself was born without a right leg, and hosted the Australian Broadcasting Corporation's coverage of the Beijing Paralympics) would host The Last Leg, a Paralympic-themed late night talk show that followed the conclusion of each night's coverage. Channel 4's coverage of the Games drew relatively high viewership; its coverage of the opening ceremony was seen by an average of 7.6 million viewers, a 40% share, and peaked at 11.2 million viewers—making it one of Channel 4's most-watched programmes in network history. Primetime coverage saw an average of 3.3 million viewers nightly, while viewership peaked at 4.5 million viewers during the men's T44 200m final where Alan Oliveira beat Oscar Pistorius for the gold medal. Its coverage of the closing ceremony peaked at 7.7 million viewers. Similarly extensive coverage was televised by RTVE in Spain, with approximately 150 hours of live coverage on Teledeporte and TVE HD. The Australian Broadcasting Corporation aired over 100 hours of coverage across its networks during the Paralympics, with coverage on both ABC1 and ABC2. Coverage of the Games set viewership records for ABC, peaking at 1.6 million viewers on average (in comparison to 1.3 million in Beijing), while ABC2 peaked at a 4.7% viewership share, beating competing digital networks. ABC's coverage was also nominated for a Logie Award for "Most Popular Sports Program". In the United States, NBC Sports provided five-and-a-half hours of coverage in total, and no live coverage. Pay TV channel NBC Sports Network aired one-hour highlight shows on 4, 5, 6 and 11 September while NBC broadcast a special recapping the Games on 16 September – a week following their conclusion. The United States Olympic Committee provided additional coverage through its own digital outlets. Critics and American athletes expressed disappointment at NBC for its decision not to broadcast any live coverage of the Games, continuing the broadcaster's trend of providing minimal coverage for the Paralympics. In Canada, rights were held by Canada's Olympic Broadcast Media Consortium; TSN (English) and RDS (French) produced daily hour-long highlight programs (some of which were aired by CTV Television), while tape-delayed airings of the opening ceremony were carried by Sportsnet One, TSN2, RDS, and RDS2. The coverage was simulcast with open audio descriptions by AMI-tv, a network which broadcasts programming with accommodations for those who are visually or hearing impaired. AMI-tv also broadcast supplemental programming, such as a daily news program from London and a documentary series focusing on Canadian athletes at the Paralympics. The Telegraph Media Group won the Best Written (print and online) award and Channel 4 won the best broadcast award. The best radio award went to BBC World Service and Larry Wong working for Edmonton Journal won the best photo prize for his image of Benoit Huot. The role of IT company Atos as a technology provider and official sponsor of the Paralympic Games was criticised by disability-rights groups, due to its contract with Britain's Department for Work and Pensions to carry out capability assessments that determine eligibility for disability benefits. They argued that Atos's programme had lacked integrity and was intended to help cut government spending, since the assessments have resulted in many disabled workers being incorrectly judged as "fit for work" and denied benefits. Therefore, the groups considered it hypocritical for Atos to sponsor a sporting event for the disabled whilst simultaneously operating a programme that has negatively affected their lives. UK Uncut, a political group opposed to public-service budget cuts, held a series of protests dubbed "The Atos Games" to coincide with the start of the Paralympics, culminating with joint demonstrations with Disabled People Against Cuts outside the London headquarters of both Atos and the Department for Work and Pensions on 31 August 2012. Speaking at the protests, comedian Jeremy Hardy said that the programme's intent to "victimise people with disabilities" was "blatant and shameless." During the opening ceremony some British athletes reportedly obscured the Atos logo on their accreditation passes in protest of their involvement. However, an official from the British Paralympic Association denied that this had been the case. LOCOG defended Atos's involvement, stating that the company was "a critical and valued member of [the companies] delivering these Games", due to the technologies it has provided, which included information systems for managing volunteers and distributing event results. Controversy arose about seating rules for wheelchair users, after two disabled mothers accused LOCOG of having discriminatory policies. One claimed she had been told by a LOCOG staff member that spectators in a wheelchair area at the Velodrome could only be accompanied by one adult, and children could not attend without being accompanied by another able-bodied adult, while another was told that her ability to sit in a wheelchair area with her children at ExCeL London was "not guaranteed." A petition for improved access for disabled families, started by one of the mothers on Change.org, quickly collected over 30,000 signatures. LOCOG denied having discriminatory policies, stating that disabled parents could steward their children in wheelchair seating areas at events with unreserved seats, but may not all be able to sit together at events with reserved seating. LOCOG faced further criticism for how it handled the sale of tickets for the wheelchair areas within venues. In May 2012 the online sale of tickets for wheelchair areas was replaced by a dedicated telephone hotline. Organisers were criticised for their use of an 0844 revenue share number for this hotline, and for neglecting to mention on its ticketing website that calls would be charged by the minute. Former sports minister Gerry Sutcliffe viewed this as discrimination against wheelchair users, and called upon LOCOG to compensate those who had used the hotline. LOCOG denied that it was receiving additional profits from the phone line, and claimed that a dedicated line was being used to allow customers to receive a service tailored to their individual accessibility needs. A minor incident occurred involving blind Member of Parliament David Blunkett, who was attending the opening ceremony alongside a Channel 4 director. Blunkett was denied access to his seat at Olympic Stadium because there was no room for his guide dog, and had to watch the ceremony from seats in the stadium's gantry instead. However, Blunkett noted that this was an isolated incident and chose not to make an issue of it, simply advising organisers to "seek to find a solution rather than impose a preconceived notion of what is or is not possible." British official broadcaster Channel 4 received some criticism for its coverage of the Paralympics. Users of Twitter complained that its coverage of the opening ceremony contained too many commercial breaks, drawing comparisons to similar complaints faced by NBC during the Olympics' opening ceremony; unlike the BBC, who televised the Olympics in the United Kingdom, both NBC and Channel 4 are supported by advertising. Complaints noted that Channel 4 had shown five ad breaks within the first hour of the ceremony, and that ironically, it had recently broadcast a six-hour long late-night dance music special with no adverts at all. Channel 4 defended the criticism by stating that it had broadcast "significantly fewer" commercials than normal for primetime programming during the ceremony, and that the ad breaks were needed in order to help the channel invest in broadcasting programming such as the Paralympics. Criticism was also made towards comments made by Jon Snow and Krishnan Guru-Murthy during the telecast; Snow was criticized for making comments about war-torn countries during the parade of nations, while Guru-Murthy received similar criticism for quipping that "looking at the ages of these athletes, which have been helpfully provided to us, they're really quite old." Channel 4 was also accused of showing too many studio segments during the first few days of the Games rather than live events, and for missing several notable events involving British athletes, including a swimming heat where Eleanor Simmonds set a new personal best and almost beat the world record, Sarah Storey winning her eleventh Paralympic medal, and Great Britain's opening wheelchair basketball game against Germany. Channel 4 noted that time was needed during the first few days to explain Paralympic events and the classification system to viewers, and that it was operating three additional channels' worth of live coverage throughout the Games. The broadcaster also stated that it had to make editorial decisions on which events to air during periods where a large number of events were in progress. The amount of live coverage was also affected by Olympic Broadcasting Services, who did not send cameras or provide official television coverage for sports such as cycling, the marathon, and shooting. Channel 4's news department did send its own cameramen to film the affected events for highlights, but was unable to broadcast them live. In the United States, NBC Sports held the broadcast rights to both the Olympics and Paralympics in 2012. NBC had been frequently criticised in past years by American athletes and IPC officials for its minimal coverage of past Paralympics, and it was speculated by critics that NBC's history of inadequate coverage may have impacted New York City's bid for the 2012 Summer Olympics and Paralympics. In 2008, it did not air any coverage while the Games were in progress (neither live or delayed), choosing to air a recap documentary on NBC in November 2008, followed by a week of highlights on Universal Sports. While relatively larger than its Beijing coverage, NBC produced only five-and-a-half hours of specials featuring tape delayed highlights of the Games; most of them aired on pay-TV channel NBCSN, while the last aired on NBC a week following the conclusion of the Games. No coverage of the opening and closing ceremonies, nor any live coverage, was provided. By contrast, some broadcasters (such as the host broadcasters, and broadcasters in Australia and Spain) planned to air at least 100 hours or more of coverage from London, and NBC itself had provided extensive coverage of the London Olympics, which was heavily viewed. NBC's lack of coverage drew the ire of American disability rights groups and IPC president Philip Craven, who expressed his disappointment for American athletes and viewers who were unable to fully experience the games on television. Craven remarked that "some people think that North America always [leads] on everything, and on this they don't. It's about time they caught up." Following the closing ceremonies, Craven hinted that the IPC might exercise greater scrutiny on broadcasters at future Paralympics by stating that "if we find our values don't fit, we'll have to go somewhere else." NBC acquired the rights to the 2014 and 2016 Paralympic Games in September 2013; the broadcaster vowed to air a relatively larger amount of Paralympic coverage from Sochi and Rio de Janeiro respectively—in particular, NBC and NBCSN were to air at least 66 hours from Rio. Craven praised NBC's decision to devote a relatively larger amount of airtime to future Paralympics, sharing his hope that U.S. audiences would be "as captivated and emotionally enthralled as the billions around the world who tuned in to London 2012 last summer." During the women's class F35/36 discus competition, an error in scoring caused the wrong medals to be presented. In this combined class event, final standings were determined based on a points calculation. The calculation converted distances thrown into points, to account for the different functional impairments of the participating athletes. Due to an error in the scoring system, the gold medal in the event was originally awarded to Ukrainian athlete Mariia Pomazan. When the mistake was discovered, the recalculated points showed that Chinese athlete Wu Qing had finished first, with Pomazan in second place. A second medal ceremony was held, which Pomazan did not attend in protest. She was eventually required to return her gold medal. ^ a b c d Gibson, Owen (25 August 2012). "Paralympics organisers feel London is launchpad for mass-market Games". The Guardian. Retrieved 3 October 2013. ^ "History of the Paralympics". BBC Sport. 6 July 2004. Retrieved 1 August 2012. ^ "Mandeville Legacy: Stoke Mandeville 1984". Retrieved 14 August 2012. ^ a b c d Gibson, Owen (9 September 2012). "Paralympics closing ceremony review: an emotional and fiery finale". The Guardian. London. Retrieved 12 September 2012. ^ "Paralympics 2012: London to host 'first truly global Games'". BBC Sport. Retrieved 1 August 2012. ^ "London beats Paris to 2012 Games". BBC News. 6 July 2005. ^ Culf, Andrew (6 July 2005). "The party that never was: capital marks the games at last—Eight weeks after Olympic celebrations were cut short by bombings, London puts on a low-key spectacle to show it means business". The Guardian. Archived from the original on 2 October 2008. Retrieved 22 August 2008. ^ a b Topping, Alexandra (13 August 2012). "London 2012: let the Paralympics preparations begin". The Guardian. Retrieved 18 August 2012. ^ a b Gibson, Owen (30 August 2012). "Paralympics reignite the Olympic buzz but with added twists". The Guardian. London. Retrieved 31 August 2012. ^ "London sets out road plans for Paralympics". Logistics Manager. Archived from the original on 28 August 2012. Retrieved 15 August 2012. ^ Gardner, Jasmine (26 July 2012). "The Olympic commute... Get ahead of the Games by bike". London Evening Standard. Retrieved 14 August 2012. ^ Topham, Gwyn; Topping, Alexandra (12 August 2012). "Transport fears as Paralympic ticket sales surge". The Guardian. London. Retrieved 13 August 2012. ^ "New station lifts open in time for Paralympics". BBC News. 14 August 2012. Retrieved 15 August 2012. ^ "Media guide to the London 2012 Paralympic Games Handover segment, Closing Ceremony, Beijing 2008 Games" (PDF). London 2012. 17 June 2008. Archived from the original (PDF) on 8 June 2011. Retrieved 20 August 2011. ^ "Mayor of London — Video clips: Olympic and Paralympic flags raised at City Hall". Legacy.london.gov.uk. 26 September 2008. Archived from the original on 13 January 2012. Retrieved 22 September 2011. ^ "1948 Olympians and 2012 hopefuls join Beijing heroes as Olympic and Paralympic flags raised at City Hall". Legacy.london.gov.uk. 26 September 2008. Archived from the original on 13 January 2012. Retrieved 22 September 2011. ^ "London 2012 to Host International Paralympic Day in September 2011". International Paralympic Committee. Retrieved 22 April 2014. ^ "London 2012: David Cameron visits Paralympic Day". BBC News. 8 September 2011. ^ "Sainsbury's Super Saturday". J Sainsbury plc. Archived from the original on 30 March 2014. Retrieved 22 April 2014. ^ Tom Degun (10 September 2011). "Sainsbury's Super Saturday is a hit as pop stars help promote London 2012 Paralympics". Inside the Games. Retrieved 22 April 2014. ^ "After the 2012 London Olympics, Will Sponsors Embrace the Paralympics?". Time. 7 September 2012. Retrieved 5 January 2014. ^ a b c "Ad of the Day: Paralympic Games Forget the Olympics. This is the summer's most stunning sports commercial". Adweek. Retrieved 11 August 2012. ^ a b c Usborne, Simon (19 July 2012). "Paralympics: Channel 4's superhuman effort". The Independent. London. Retrieved 11 August 2012. ^ Sweney, Mark (22 June 2013). "Cannes Lions: Dumb Ways to Die scoops top award". The Guardian. London. Retrieved 23 June 2013. ^ "Royal Mail launches major series of Olympic Stamps for London 2012". Royal Mail Group. 24 August 2009. Retrieved 22 September 2011. ^ "Royal Mail releases final set of 2012 Olympic stamps | London 2012". insidethegames.biz. 22 July 2011. Retrieved 22 September 2011. ^ "Year-to-go Olympic stamps unveiled by Royal Mail". BBC News. 22 July 2011. ^ "Gold Post Boxes Launched For ParalympicsGB Gold Medal Winners". Pocklington Post. 29 August 2012. Retrieved 10 September 2012. ^ a b c Taylor, Matthew (8 August 2012). "Royal Mail defends decision to deny Paralympic gold medallists own stamps". The Guardian. London. Retrieved 12 August 2012. ^ a b c Topping, Alexandra (15 August 2012). "Royal Mail will issue stamp for every UK Paralympic gold medal winners". The Guardian. London. Retrieved 16 August 2012. ^ "GB goalball hopeful on Paralympic place after test event". BBC Sport. Retrieved 11 August 2012. ^ a b "London 2012: Scouts to spark Paralympic flame". BBC News. 15 August 2012. Retrieved 16 August 2012. ^ Taylor, Jerome (15 August 2012). "Mountain cauldrons will spark Paralympic torch relay". The Independent. London. Retrieved 19 August 2012. ^ Williams, Tim (22 August 2012). "Paralympics 2012: flames lit across Britain at the start of Paralympic torch relay celebrations". The Daily Telegraph. London. Retrieved 23 August 2012. ^ Ward, Victoria (28 August 2012). "Four Paralympic flames united at Stoke Mandeville". The Daily Telegraph. London. Retrieved 29 August 2012. ^ "Paralympics 2012: Backup torch is lit after delays cause fears that flame won't make opening ceremony on time". The Daily Telegraph. London. 29 August 2012. Retrieved 30 August 2012. ^ a b c d e Gibson, Owen (30 August 2012). "Paralympics 2012 opening ceremony: Games launched on a storm of ideas". The Guardian. London. Retrieved 30 August 2012. ^ a b c d e "Paralympics tickets raise £10m more than predicted". BBC News. 6 September 2012. Retrieved 6 September 2012. ^ a b William, Helen (8 August 2012). "2.1m Paralympic tickets snapped up". The Independent. London. Retrieved 11 August 2012. ^ Sims, Paul; Burman, James (13 August 2012). "Race is on for Paralympic seats: Event set to sell out... that's if you can actually buy a ticket". Daily Mail. London. Retrieved 15 August 2012. ^ Eccles, Louise (21 August 2012). "Final ticket rush for London 2012: Games are just 200,000 tickets away from becoming first ever sold out Paralympics". Daily Mail. Retrieved 23 August 2012. ^ Cecil, Nicholas (7 August 2012). "Interest in 'Blade Runner' Oscar Pistorius pushes up London 2012 Paralympic ticket sales". The Independent. Retrieved 11 August 2012. ^ "Paralympic tickets on sale during Games". BBC News. 28 August 2012. Retrieved 28 August 2012. ^ "London 2012 logo to be unveiled". BBC Sport. 4 June 2007. Archived from the original on 13 June 2007. Retrieved 4 June 2007. ^ "London unveils logo of 2012 Games". BBC Sport. 4 June 2007. Archived from the original on 1 September 2007. Retrieved 5 July 2007. ^ Farquhar, Gordon (19 May 2010). 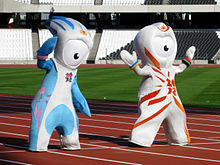 "London 2012 unveils Games mascots Wenlock & Mandeville". BBC News. Archived from the original on 22 May 2010. Retrieved 19 May 2010. ^ McKay, George (30 August 2012). "Spasticus Autisticus at the Paralympics opening ceremony". Retrieved 22 April 2014. ^ "Paralympic Games: Closing ceremony led by Coldplay". BBC News. 10 September 2012. Retrieved 10 September 2012. ^ Batty, David (9 September 2012). "London 2012 Paralympics closing ceremony – as it happened". The Guardian. Retrieved 10 September 2012. ^ a b "It's Official – London 2012 to be Biggest Paralympic Games Ever". Paralympic.org. Retrieved 8 July 2012. ^ a b "Participation Numbers London 2012". IPC. Retrieved 2 November 2012. ^ "Participation Numbers Beijing 2008". IPC. Retrieved 23 April 2014. ^ "Paralympic athletes thrill students". Trinidad and Tobago Guardian. 17 May 2012. ^ "Trinidad and Tobago Paralympic Committee". International Paralympic Committee. Retrieved 22 April 2014. ^ "Andorra Paralympic Committee". International Paralympic Committee. Retrieved 22 April 2014. ^ Degun, Tom (29 August 2012). "Botswana and Malawi pull out of London 2012 Paralympic Games". inside world parasport. Archived from the original on 29 August 2012. Retrieved 29 August 2012. ^ a b "Intellectual disability ban ends". BBC Sport. 21 November 2009. Retrieved 23 August 2012. ^ "President's Newsletter July 2010" (PDF). International Sports Federation for Persons with Intellectual Disability. July 2010. Archived from the original (PDF) on 28 August 2012. Retrieved 13 August 2012. ^ "Paralympics set to alter entry policy". BBC News. 13 September 2008. Retrieved 13 August 2012. ^ "Paralympics 2012: The able-bodied athletes at the Games". BBC News. 31 August 2012. Retrieved 31 August 2012. ^ "2012 Paralympic schedule revealed". BBC News. 25 August 2011. ^ Database. "Medal Standings - London 2012 Paralympic Games". International Paralympic Committee. Retrieved 22 April 2014. ^ "Paralympics 2012: full list of every medal winner - and how they break down". Datablog. The Guardian. Retrieved 22 March 2014. ^ "Scramble to prevent blank TVs". The Nation. Retrieved 26 August 2012. ^ "London 2012 Paralympics: organisers hail record broadcast deals". The Telegraph. 25 April 2012. Retrieved 4 October 2013. ^ "Paralympics TV deals break new ground as ticket rush continues". The Guardian. Retrieved 4 October 2013. ^ a b "Channel 4 lands 2012 Paralympics". BBC Sport. 8 January 2010. Retrieved 4 October 2013. ^ "BBC Paralympic Coverage Details". BBC Sport. 16 August 2012. Retrieved 9 October 2012. ^ a b c Hough, Andrew (30 August 2012). "Paralympics 2012: Channel 4 under fire over opening ceremony adverts". The Daily Telegraph. London. Retrieved 30 August 2012. ^ "IPC Announce London 2012 Livestream Commentators". International Paralympic Committee. 16 August 2012. Retrieved 19 August 2012. ^ Wootton, Dan (16 August 2012). "INSIDE THE BOX: Balding's got Channel 4 jumping for joy as she gets on her marks to front Paralympic broadcast". Daily Mail. London. Retrieved 16 March 2014. ^ "C4 opens Paralympic tender process". Broadcast Now. Retrieved 8 February 2014. ^ "Channel 4 to be the Paralympic Broadcaster in the UK in 2012". Channel 4. 8 January 2010. p. 3. Retrieved 3 January 2012. ^ "Unprecedented Rolling Coverage for London 2012". Paralympic.org. Retrieved 8 July 2012. ^ "Channel 4 starts Paralympic Games push". Digital Spy. Retrieved 4 October 2013. ^ Emine Saner (24 August 2012). "Australian comedian Adam Hills: 'I was born without a foot. Dull. Move on'". London: The Guardian. Retrieved 19 September 2012. ^ Metlikovec, Jane (19 June 2008). "Comedian Adam Hills to host Paralympics". Herald Sun. Retrieved 19 August 2008. ^ John Plunkett (30 August 2012). "Paralympics opening ceremony attracts almost 8m viewers". London: The Guardian. Retrieved 30 August 2012. ^ "Channel 4's Paralympics coverage boosted by Pistorius controversy". The Guardian. Retrieved 14 March 2014. ^ "Paralympic closing ceremony watched by 7.7m". BBC News. Retrieved 16 March 2014. ^ a b "RTVE ofrecerá en Londres 2012 la mayor cobertura de unos Juegos Paralímpicos" [RTVE will offer the most Paralympic Games coverage at London 2012] (in Spanish). RTVE. Retrieved 29 August 2012. ^ a b "ABC Paralympic coverage up for Logie award". Australian Paralympic Committee. Archived from the original on 5 October 2013. Retrieved 4 October 2013. ^ a b "Paralympics a ratings winner for ABC2". The Australian. 12 September 2012. Retrieved 4 October 2013. ^ Press release. "USOC announces expanded coverage for London 2012 Paralympic Games". United States Olympic Committee. Archived from the original on 15 August 2012. Retrieved 14 August 2012. ^ a b c Davies, Gareth A (24 August 2012). "Paralympics 2012: NBC to only screen five-and-a-half hours retrospective coverage of Games". The Daily Telegraph. London. Retrieved 24 August 2012. ^ "Broadcasting Decision CRTC 2007-246". Canadian Radio-television and Communications Commission. Retrieved 27 February 2012. ^ "How to Watch the London 2012 Paralympic Games". CTVOlympics.ca. 7048467 Canada, Inc. Retrieved 25 August 2012. ^ "Follow Your Team: Canadian Paralympic Committee Announces London 2012 Paralympic Games Coverage". Canadian Paralympic Committee. 23 July 2012. Retrieved 22 April 2014. ^ "Media advisory - AMI reveals reporter lineup for Paralympic Games". Press release. Archived from the original on 4 March 2016. Retrieved 22 April 2014. ^ Davies, Gareth (23 November 2013). "Telegraph wins third consecutive award for coverage of the 2012 London Paralympic Games". The Telegraph. ^ "Atos comes under attack in emotional Commons debate". The Guardian. Retrieved 5 October 2013. ^ a b Poulton, Sonia (30 August 2012). "The Atos Games will showcase disabled people's anger at Paralympic sponsors". The Guardian. London. Retrieved 30 August 2012. ^ a b Gibson, Owen (28 August 2012). "Paralympics organisers defend sponsor Atos in face of protests". The Guardian. London. Retrieved 30 August 2012. ^ a b Addley, Esther (31 August 2012). "Paralympic sponsor Atos hit by protests". The Guardian. London. Retrieved 31 August 2012. ^ Bains, Inderdeep (15 August 2012). "Paralympics rules 'make disabled feel non-human': Fury after wheelchair-user parents are told they cannot sit with families at event". Daily Mail. London. Retrieved 18 August 2012. ^ "Locog assures disabled parents over Paralympic tickets". Channel 4. Retrieved 19 August 2012. ^ "Paralympics wheelchair bookings 'discriminate', MP says". BBC News. 26 August 2012. Retrieved 29 August 2012. ^ "Paralympics organisers accused of discriminating against wheelchair users with high-cost phone line". The Daily Telegraph. London. 26 August 2012. Retrieved 28 August 2012. ^ Hope, Christopher (31 August 2012). "David Blunkett turned away from stadium for Paralympics' opening ceremony because of his guide dog". The Daily Telegraph. London. Retrieved 11 September 2012. ^ Rosie Taylor (29 August 2012). "'Nice, sell cars off the back of the national anthem': Viewers' anger at Channel 4 as coverage of Opening Ceremony is interrupted by repeated advert breaks". Daily Mail. London. Retrieved 30 August 2012. ^ "Channel 4 to host all-night rave". BBC News. Retrieved 28 April 2014. ^ a b Gibson, Owen (1 September 2012). "Channel 4 hits back at critics after boost from Paralympics audiences". The Guardian. London. Retrieved 9 September 2012. ^ O'Brien, Liam (7 September 2012). "Paralympic Shorts: It's officially the greatest Games ever". The Independent. London. Retrieved 9 September 2012. ^ NBC to Air Stirring Documentary on 2008 Paralympics Archived 4 December 2008 at the Wayback Machine" TV Guide. November 7, 2008. Retrieved on November 7, 2008. ^ a b c "NBC criticised Paralympics after opening ceremony blackout". The Daily Telegraph. London. 30 August 2012. Retrieved 10 September 2012. ^ "American broadcaster NBC could lose right to show Games after criticisms". Metro. Retrieved 10 September 2012. ^ Davies, Gareth A (24 September 2013). "Paralympic Movement given huge boost as American channels NBC and NBCSN will cover next two Games". The Daily Telegraph. London. Retrieved 10 February 2014. ^ "Paralympic discus thrower must return gold medal, says IPC". The Guardian. 3 September 2012. ^ "Paralympics 2012: Mariia Pomazan returns discus gold". The Telegraph. 6 September 2012. Wikimedia Commons has media related to 2012 Summer Paralympics.